This content was published: January 26, 2018. Phone numbers, email addresses, and other information may have changed. 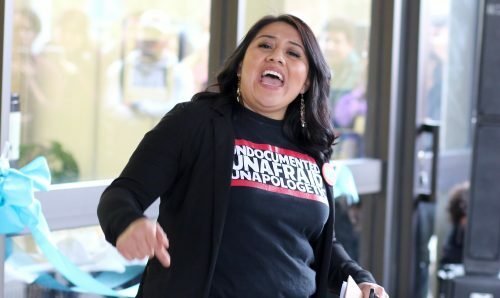 On Monday, Jan. 22, a long-held dream of Portland Community College undocumented and Deferred Action for Childhood Arrivals (DACA) students and their families finally came true. 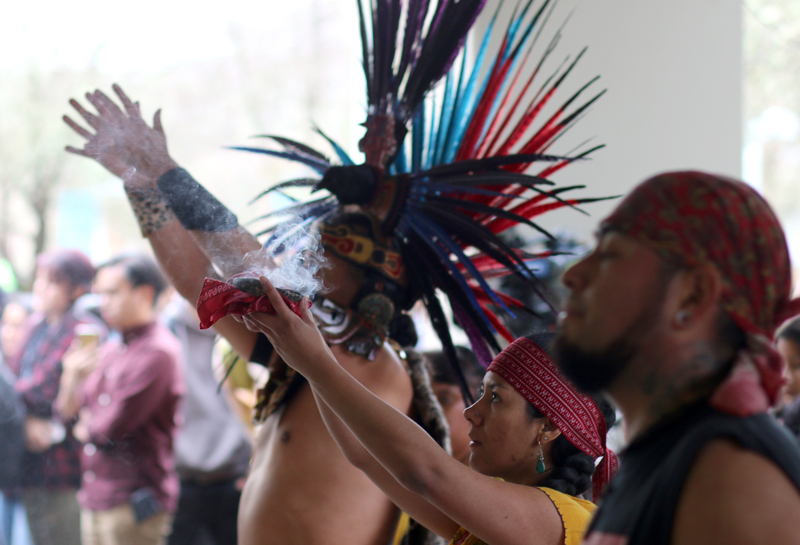 Amid traditional dancing by the group Mitotiliztli Tezcatlipoca & Titlakawan, directional prayers, poignant speeches and high-octane chants, students and staff cut the blue ribbon signifying the official opening of PCC’s DREAM Center, the first of its kind at an Oregon community college or university. 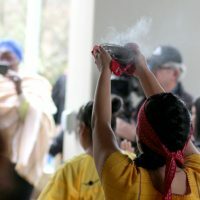 The center, located in Room 101 of Building 2 at the Rock Creek Campus, was made possible through a $50,000 grant from the Oregon Immigrant and Refugee Funders Collaborative and the Meyer Memorial Trust. The DREAM Act stands for the Development, Relief, and Education for Alien Minors. 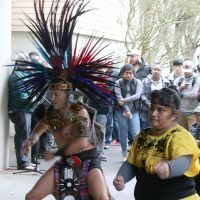 Prayers and dancing were performed by Mitotiliztli Tezcatlipoca & Titlakawan. 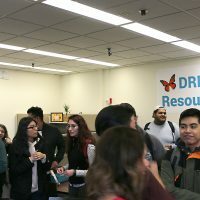 The resource center will offer outreach, education, advocacy and community resources, bilingual materials, and funding for urgent and emergency services for undocumented and DACA students and their families. Specifically, the center’s provisions will include legal services, the facilitation and processing of initial DACA applications and renewal applications, workshops on student support and college navigation resources, and academic/career advising sessions. The center intends to serve 20 families and 20 students per academic term. For additional support and resources, the center will partner with local community organizations Adelante Mujeres, the Hillsboro School District, Momentum Alliance, Centro Cultural, and the Hispanic Metropolitan Chamber of Commerce. The idea for the center came from the students. They wanted to ease pressures on DACA recipients by taking down barriers to financial assistance and the navigation of college resources. Under the supervision of the campus’ Multicultural Center, the students came up with a plan, did exhaustive research, and presented their final concept to college leadership. Petrona Dominguez leads the Rock Creek Campus crowd in chants. The opening of the first DREAM Center in the state fits into PCC’s mission. 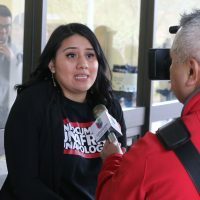 Last year, the college’s Board of Directors declared the institution a “sanctuary college,” to aid and protect undocumented students. President Mark Mitsui emphasized concerns about the impact of potential changes in federal immigration policy on PCC’s undocumented students as the reason for the decision. 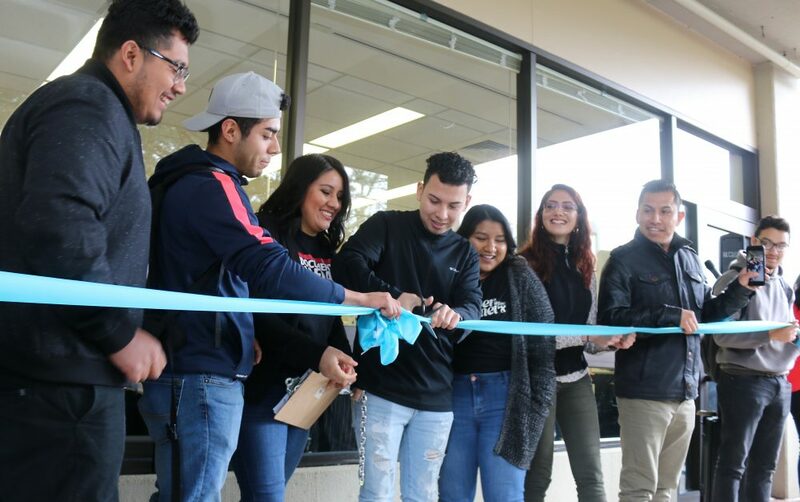 The students and their new resource center coordinator — Jhoana Monroy — appreciated the symbolism of the event. PCC takes intentional action that creates a climate of learning where people from all backgrounds and abilities enjoy equal access to the opportunity to teach, learn, work, and serve the community and the world. PCC promotes the success, dignity, and worth of each individual by providing a safe environment where the examination of divergent ideas, experiences and systems of inequality adds depth to the learning experience. Learn more about the college’s strategic vision! While the college spends it’s time virtue signalling its cheery success working to protect criminals, there are thousands of homeless and millions of poor minorities in the United States who are hurt by illegal immigration. I don’t support this and am disgusted by the college’s decision to endorse this. Thank god Donald Trump is president, we need to look out for our nation’s economic and cultural interests instead of being manipulated by weaponized empathy. I think this a beautiful thing PCC did for the people who did not have a choice on coming to this country and made the best out of it. In a country that. Way to go PCC…!!! I am beyond happy to see this happen. What a positive direction for our state. PCC is leading a great example for other college and universities that need to start providing the services and support needed by the undocumented/dacamented community. In regards to the previous comment, undocumented students typically pay out of pocket for their tuition and service fees- so they are paying for the fees that go into running the DREAM Resource Center. Undocumented/dacamented students take nothing away from other PCC students. Additionally, the taxes they (and their parents) pay fund the college through local bonds that support the college. Not to mention the taxes they pay and the money they spend on everything else all contribute to the health of our local economy. So, I disagree that undocumented immigrants hurt American citizens. On the contrary, undocumented immigrants are constantly on the giving end, contributing to their country and communities. It is about time we give back to this highly exploited community. Great job PCC! Josh – I’ve likewise had comments critical of supporting criminals deleted. It seems that PCC only wants speech that toes the party line. Any rational arguments for the upholding of the law are seen as dangerous to the gushy politicized feels of the raving mob. You receive money from the federal government. You have zero right to censor speech, respectful or not, spam or not, on or off topic. You applaud criminals while deleting the free speech of a citizen of the United States. If you had respect you would not be deleting comments you find distasteful or counter to your agenda. As a solider who loves this country and has fought to protect it, I would like to apologize to the dreamers on behalf of the narrow-minded people who would attack them. When my ancestors came to this country, they were not welcomed with open arms either… Despite that, they believed in what this country stood for and dreamed of becoming citizens. I pray that all of you will be granted the same opportunity. @Sargent I want to thank you for the support. It has been hard work but I am thankful that it is finally being done. For those who call us criminals really need to look up and learn the law they so much love. What they will find is that entering illegally is not a “crime” it is actually a “civil offense” I hope for those closed minded people to take the time and to get to know the people they are so scared of. Nice, you put up some of my comment but delete the part that accurately describes the behaviour of the ‘editors’ here. The policy is not robust. “Abusive material” is a subjective weasel term; petty authoritarians can (and do) abuse it for their own ends. “Contribute to the conversation” is another subjective, weasel term that can, and will, be abused by petty tyrants. Wasn’t Joseph Goebbels a public relations writer?